Guide to World Cultural Heritage Site "Himeji Castle"
We will introduce Himeji Castle, a historical Japanese medieval fortress registered as a world cultural heritage site in 1993.The castle is located in the center of Himeji City, about 50 km west of Kobe City. It takes only 16 minutes by JR bullet train from Shin-Kobe station and 42 minutes by JR rapid train from Sannomiya station. Those wishing to step back in time and experience the feeling of a Japanese samurai warrior would be well advised to visit this architectural treasure. Himeji Castle is often called by the familiar names of either Hakuro-jo or Shirasagi-jo, meaning "white heron" in Japanese, and there are various explanations why. 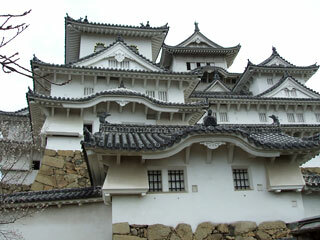 One explanation involves how the white plastered walls of the main donjon and 3 small donjons connected to elevated 'yagura' (turret) corridors create an image of a white heron with its wings spread out to take flight. 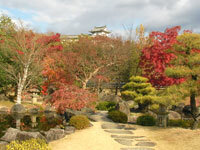 The castle, along with Horyuji Temple, was designated in 1993 as Japan's first UNESCO World Cultural Heritage Site because of its utilization of high level architectural techniques spanning from the Azuchi-Momoyama period to the early stages of the Edo period (the 16th-17th century). Many legends remain in Himeji Castle, a setting for such famous stories as Sen-hime, granddaughter of Tokugawa Ieyasu, Miyamoto Musashi's suppression of a monster, and the ghost Okiku's well from the story of Banshu Dish Mansion. * Take either a JR Shinkansen bullet train from Shin Kobe Station (16-minute train ride) or a limited express train from the JR Sannomiya station (42-minute train ride) and get off at Himeji Station. * To reach the castle, you can walk 15 minutes from the north exit or take a short bus ride on the Shinki Bus and get off at the "Himeji Otemon Mae" bus stop. * A shuttle bus runs from the station to the castle on Saturdays, Sundays, and national holidays. * From "Fukusaki IC" on the Chugoku Expressway, travel along the Bantan Renraku Expressway to "Hanada IC", then take the Route 397 toward Himeji City. Akamatsu Norimura, the leader of a local powerful clan in Harima district or the southwestern Hyogo, assembled one thousand two hundred mounted warriors supporting Emperor Godaigo on Mount Himeyama and sent to Kyoto in 1333. 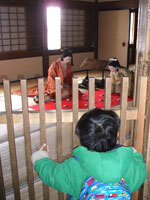 Thirteen years later in 1346, his second son Sadanori constructed a small mountain castle on Mount Himeyama. 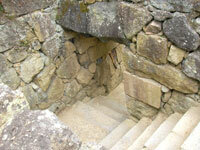 This served as the beginning for Himeji Castle. 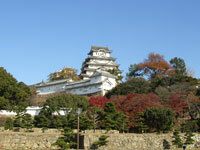 When Toyotomi Hideyoshi took control over all of Harima, Kuroda Yoshitaka (also known by the name of Kanbei) presented Himeji Castle as a base for the suppression of the Mori family of the Chugoku region. In 1580, Hideyoshi, rebuilt the mountain castle in 1580 with a three-story donjon over a period lasting a year to complete. However, after the battle of Sekigahara, Ikeda Terumasa, husband of Ieyasu's second daughter, became the lord of the castle. He destroyed the Himeji Castle built by Hideyoshi and began building Himeji Castle with a 5-story donjon in 1601 that took 8 years to complete. 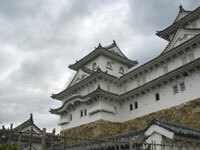 In 2001, the 400-year anniversary for the construction of the castle was celebrated along with its 70-year anniversary for being designated a national treasure. The "Major Heisei Restoration" will be performed over a period of five and a half years beginning in the autumn of 2009. A huge temporary building with a height of 52m will be built by 2010 to be used in the replastering of the white walls and the replacement of the 73,000 roofing tiles of the main donjon (height 46 m). Visitors can take one of the 2 glass transparent elevators up to the observation deck (about 300m2) to inspect the restoration operations through a glass panel. 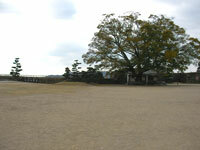 Akamatsu Norimura of a powerful family in Harima district built a fortress on Mount Himeyama. 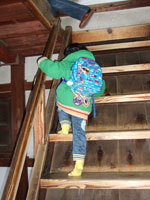 His second son Sadonori builds a mountain castle on Mount Himeyama. 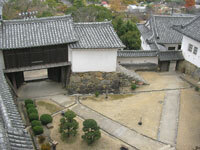 Hideyoshi begins building a three-story donjon for attacks on the Chugoku region and completes it in 1581. 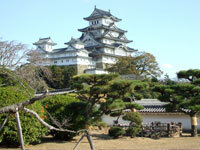 After the battle of Sekigahara, Ikeda Terumasa, the husband of Ieyasu's second daughter, takes control of Himeji Castle. In the following year, a major reconstruction begins on the castle and is complete in 1609 with a 5-story donjon. Honda Tadakatsu takes over Himeji Castle and enlarges the San-no-Maru, the outermost circumference of the castle, the Nishi-no-Maru, and has other construction done. After the Meiji Restoration, Harima district was reclaimed by the Imperial Court and Himeji Castle became a national possession. 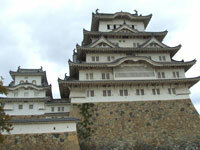 The donjons and turret corridors (total of 8) of Himeji Castle are designated national treasures. The construction begins with the dismantling of donjons for repair and 8 years later for completion of all repairs in 1964. The castle is registered by the UNESCO as world heritage site. The 400th year of existence and 70th year as national treasure is celebrated. 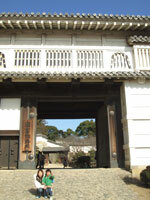 This gate shaped in a form called yagura-mon (turret gate) is the largest and serves as the main entrance to Ni-no-Maru. 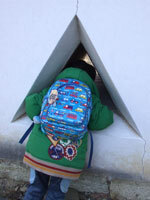 It was given this name for its Hishi (water- caltrop) crests carved into the roofed gate. This garden offers an impressive view of the west side of the main donjon and near the place where the south gate stood and is the place where the warriors taking field gathered. 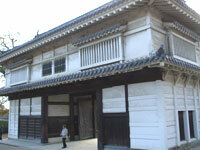 This is the place where the attendants of Tokugawa Ieyasu's granddaughter Sen-hime (Princess Sen) lived. 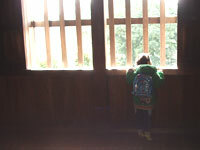 Sen-hime bowed in reverence to the mountain from this corridor. 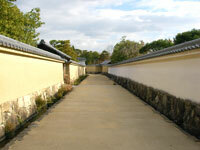 When Sen-hime bowed to the mountain, she would take a rest in this turret corridor and apply her makeup. This turret corridor became known as Kesho (make-up) Turret. The donjon was given this name since it was a small tower positioned on the northwest corner (called the 'inui' direction) of the main donjon. Among the three small donjons, this was the largest with 3 layers, but there was an internal layer that gave it four stories with the 1st floor being underground. This donjon was positioned in the southeast corner. Its exterior has 5 layers and there are 6 stories with the 1st floor being underground. 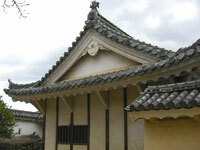 A pair of shachi-gawara (grampus-shaped tile) decorates both sides of the top roof. Dormer Gable and Chinese Gable are combined to express a stylish beauty of harmony. 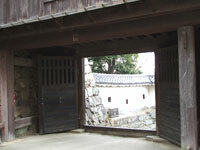 This indicates the Kisai-mon or the back gate of the castle. The steep terrain of Mount Himeyama was used, and winding path was constructed with intermediate gates, making it difficult to attack. This is a part of the Honmaru or main enclosure where the castle lord lived and was also a place where guests were received, but the building was destroyed by fire in 1882. 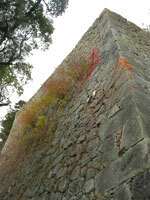 This stonewall of the turret corridor is the highest in the castle at around 23 meters. 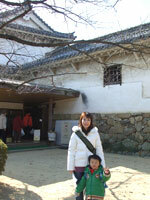 At the top of this stonewall area watchtower and a building built in the sukiya style. There was a drain board for dispensing steam inside, and it is said that this was used as room for tea ceremonies. 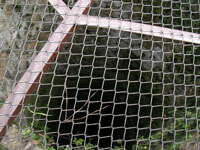 The well in the compound called Kami-Yamazato-Maru within the castle was originally called Tsurube-tori. This is the well that Okiku from the legend of Banshu Sara-yashiki (Dish Mansion) threw herself into because she felt responsible for breaking a dish. Every night the voice of Okiku can be heard at the bottom of the well counting dishes, "One dish, two dishes, ..."
It is a contrivance to prevent enemies from climbing the stonewall. It gets its name from its curved shape that resembles an opened fan. 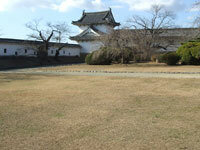 There are many gates and turret corridors positioned here and arranged to make it difficult for enemies to penetrate. These were constructed to drive the enemy into narrow passages and areas with dead ends. 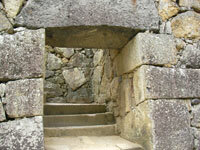 This is a shortcut to the main donjon using a gate in a form called komon. The stonewall structure was built to slightly shake in a few places, and since it cannot be seen from the Hishi Gate, the road traveling here is called a "secret passage." This is a moat without water within the Hishi Gate, and it is positioned in an important place to suppress the enemies from advancing forward for the actual path of the Ni-no-Maru and the secret path. It is one of only four castles in Japan that have been designated as national treasures: Himeji Castle, Matsumoto Castle, Hikone Castle, and Inuyama Castle. The "Ten Best Spots for Viewing Himeji Castle" commemorates the Himeji Castle listing as a world heritage site in 1993 and offers ten spots selected by the general public as being highly valued for their scenic beauty. The main donjon is built on Mount Himeyama (45.6-m sea level). The height of the donjon itself is 92 m above sea level since the building is 31.5 meters and the stone wall is 14.85 for a total of 92 meters. In the past there had been 84 including the outer enclosure, but there are only 21 currently. 3,125 were recorded with around 997 within the inner enclosure, but only around 500 exist today. Width at its widest place is 34.5 m with an average of 20m. 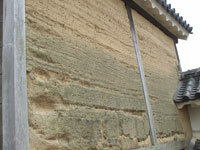 Depth is around 2.7 m.
Note: The western central pillar is made of a Japanese cypress tree taken from the Kiso national forest and has an age of 780 years. 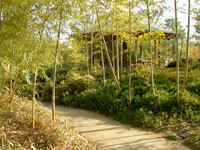 It is joined on the 3rd floor with local cypress trees aged around 670 years from Kasagata Shrine. The previous central pillar is exhibited on the outermost part of the castle ground to the right of the ticket admission booth. The eastern central pillar continues to be used as from the past. The 3-story donjon built in 1581 by Hideyoshi was demolished 20 years later, but artifacts remain from that castle and can be seen today. When Hideyoshi was building the castle, there was a shortage of boulders for the stone wall and so a poor old woman who sold yakimochi, or roasted rice cakes, donated her stone mill. As word of this spread of her sacrifice, the people the territory rushed to offer materials. 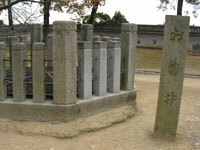 Even now there is a stone at the foot of the tower called uba-ga-ishi or elderly woman's stone. In recognition of Kuroda Yoshitaka's service, his family crest tile was used at Himeji Castle and remains even today at the west side of the 'Ni' (4th) Gate. 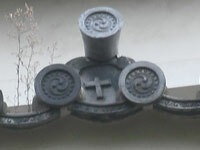 Since he was a convert to Christianity, the pattern of his family crest is in the image of a cross. 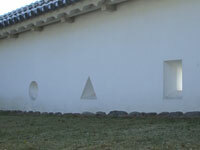 On the white wall of the Himeji Castle, there are holes in rectangular, circular, and triangular shapes bored in the wall. These openings are called either hazama or sama and are lookout windows for attacking with a gun or bow and arrow or for keeping watch. The rectangular lookouts are used for arrows and the circular and triangular lookouts are used for guns. About 500 lookup windows remain to lend a modern, formative beauty when combined with the donjons and their white plastered walls. 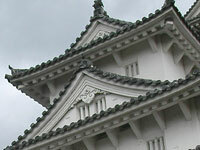 The Hafu, or gable, is the mountain-shaped part attached to the gable roof, and at Himeji Castle, you can see both Chidori Hafu (Dormer Gable) and Kara Hafu (Chinese Gables). The Dormer Gable uses a roof formed as an obtuse triangle shape for the purpose of letting in sunlight and fresh air and sometimes contains a small, hidden room called uchimuro. The top part of the Chinese Gables has a round sloped roof. 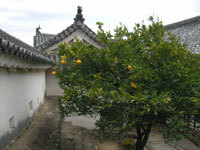 The southern side of Himeji Castle is in the largest class for Chinese Gables in Japan. 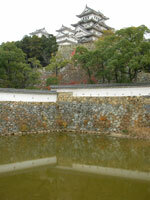 Both gables display a geometrical formative beauty to the landscape of Himeji Castle. A connection with water using the images of fish can be seen as a spiritual measure for the prevention of fires. On the roof there are famous shachihoko (imaginary sea animal) statues decorating the roof, but the decoration hanging from the gable is called gegyo, another magical protection against fire in the image of a fish. 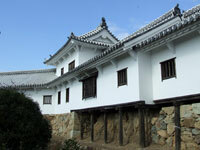 History of the name "Shirasagi Castle" (White Heron Castle)? 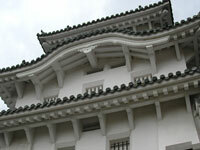 * The plastered white walls of the castle contrast the black paneling of Okayama Castle. * The hill (Mount Himeyama) on which the castle stands is nicknamed "Sagi-yama" or Heron Mountain. * The white walls resemble the white wings of a heron spreading its wings to take flight. * A large number of night herons have inhabited the place from ancient times. Why did so many different people have a hand in building the castle? * The present day structure of Himeji castle largely resembles the structure accomplished by the major reforms started in 1601. *The total number of people mobilized to work for this project is estimated to be more than 25 million people. 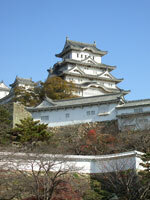 How many samurai warriors did Himeji Castle have? * In the Ikeda family period there were about 500 samurai warriors receiving a fief of 300 koku equal to approximately 4.5 tons of rice annually. * Honda Tadamasa and his son Tadatoki had more than 1,200 vassals in addition to 4,000 foot solders and servants. 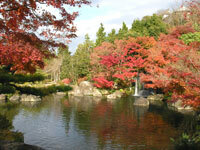 * In the Sakakibara family period there were 3,000 people. 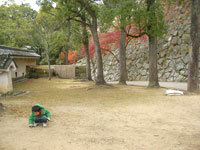 When Sakai was the last lord of the castle just before the Meiji Restoration there about 2,200 people. 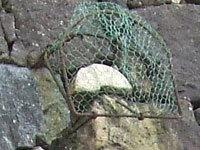 * There was a legend from the past of an escape passage, but no such passage was discovered by an investigation. * However, there was an embankment hidden under the surface of the water in the moat that could have been used to escape and cross over on foot. 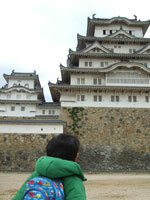 Why was Himeji Castle deserted? * After the Meiji Restoration, feudal clan domains were abolished replaced with prefectures. Since castles were unnecessary for each area and represented a huge expense to preserve, castles changed hands many times and were abolished. * As a result of an auction, Kanbe Seiichiro of Himeji City won the bid at 23 yen and 50 sen. But because the expense to dismantle and remove the castle was extremely high, he renounced the right. * Since the castle leaned in the southwest direction after its completion, the lead carpenter Sakurai Genbei felt responsible for the mistaken measurement and committed suicide by jumping off the donjon. * The reason for the castle leaning to the southwest was ascertained in dismantling of the castle for repairs. The actual cause for the castle leaning is because of sunken cliffs in the east and west. 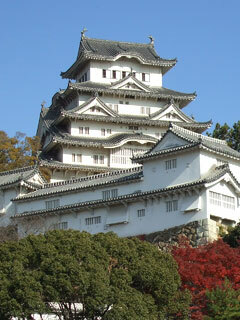 * Musashi was once a guest at Himeji Castle when Kinoshita Iesada was the lord of the castle. He went to the main donjon carrying only a small lantern and was met with a terrible flame and the castle shaking with the sound of an earthquake. Unconcerned, he climbed the steps of the donjon and stayed until daybreak when the protective deity of the castle, Gyobu Myojin appeared and gave Musashi a sword for getting rid of the monster. "Koko-en" opened in 1992 as part of a new culture combining preservation and utilization of the cultural assets in a spacious 3.5-hectare Japanese traditional round-the-pond style garden. It was established to commemorate the 100th anniversary of the municipal system. 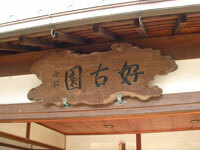 The name is associated with the school of the feudal clan "Koko-do" and was thus christened. Excavation before servicing the castle structure confirmed the ruins of streets with shops, mansion gates, pond, samurai residence, and a western mansion built by Honda Tadamasa in 1618. The garden consists of 9 different types of gardens utilizing the land where the mansion and land passages formerly stood. 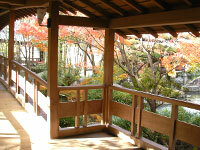 Within the garden there is a tsuiji wall (a mud wall with a tiled roof), a yashiki gate (main gate), a nagaya gate, two buildings connected by a corridor used for rest areas called "Kassuiken" and "Cho'onsai" as well as tea ceremony house called "Soju-an." A walk through the "Koko-en Garden" takes the visitor back in time to the Edo period and displays a splendid landscape showing the west side of the castle with a view of a full stretch of virgin forest. Walk 15 minutes from the north exit of the Himeji Station or take the Shinki Bus and get off at "Himeji Castle Otemon Mae" bus stop.